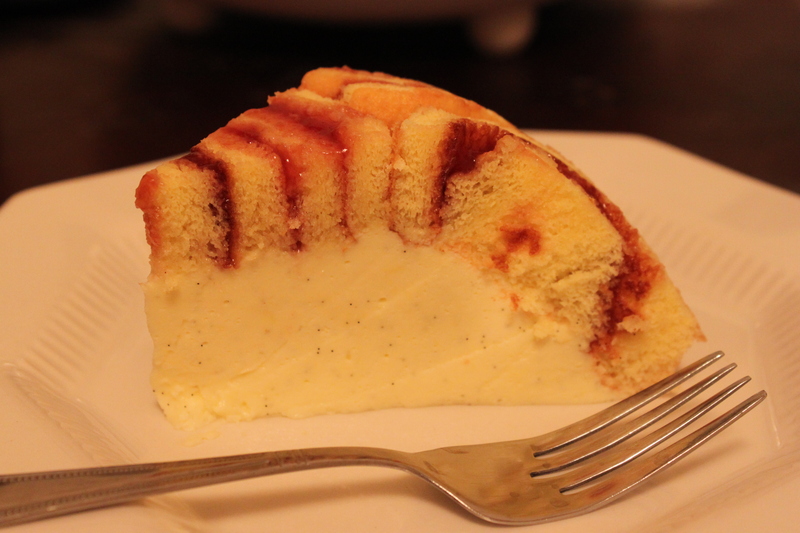 Charlotte cake is a perfect combination of rolled sponge cake and custard cream. You can make any variation if you do not like the traditional style. I don’t underestimate this cake when saying that anyone can make it, given you give it a little patient. Well, tradition always makes every baked things completely excellent. As Rose Levy Beranbaum said “A beautiful cake usually gives you a good feeling”. I absolutely consent her saying. This Charlotte is adapted from “Cake Bible” of her. 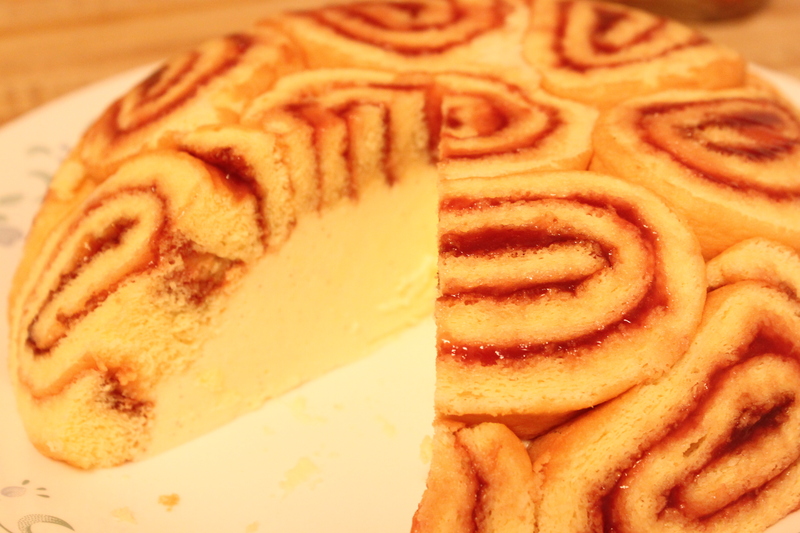 – Grease the bottom of jelly roll pan. Add the mixture to the pan and spread it evenly. – Bake at 400 F for 5-6 minutes. – Combine gelatin, whole milk, egg yolks, sugar, liqueur and let it sit for 5 minutes. – In small sauce pan, stir the custard mixture at low heat frequently until the custard is slightly thick and coat the flat spoon. Don’t bring it to a boil or you’ll get the lumps. The stirring can take 10-15 minutes. – In an ice cold water bowl, stir the hot custard until it’s cool down at room temperature. – Beat the heavy cream until it’s fluffy at medium speed. Stir in the custard until the heavy cream and the custard are smooth. – Place a wrapping plastic paper at the bottom of the 2 quart bowl. – Cut the roll into 1/4 inch thick. Arrange them in the bowl. Making the syrup by combining 3 tbsp sugar + 1/8 cup water + 1 tbsp liqueur. Drizzle the syrup over the cake. – Pour the custard cream in to the bowl and refrigerate the Charlotte for at least 6 hour before invert the cake. This entry was posted in cake, dessert, French and tagged cake, custard, french, vanilla. Bookmark the permalink. I will immediately seize your rss as I can’t find your e-mail subscription hyperlink or newsletter service. Do you’ve any? Hope you like some of my recipes. Thank you! Thank you for your interest. Nice to meet you here for the same interest.